Bobby was so sad, because was scared of the things that could be inside the huge tree, but could not resist the impulse of going inside the tree to see what was inside. Got inside the tree little by little with out realizing that it was a magical tree. When half of his body was inside the tree it was so dark, and suddenly began to fall down to the deep of the tree, was so scared that closed his eyes crying and screaming, until touched a soft surface. Opened his eyes terrified and found out a beautiful place, he had fell on a spider web which was holding him as if he was an insect. – “I won´t stay here finding out who spun this spider web” – said Bobby before getting down of the cobweb. There was a big garden inside the tree, the plants and flowers were like huge skyscrapers; but he hadn´t seen an animal yet. Suddenly heard a noise of a train approaching him, then saw a centipede coming fast with lots of ants on his back, that were going to their jobs or school. Then saw Mr. Cricket allowing him to get into the train, and the firefly helping him. – “I can´t jump like the cricket, either spin a spider web or flying like you; because I am a human”. -“A human? what a horror, you are one of those who hurt us, mash us, destroy our houses and don´t respect us at all”. – “I hadn´t seen it that way, but maybe you are right. Let´s make a deal. I want to know this beautiful place, in exchange, I promise I wont hunt innocent insects just to have them inside a jar, I actually will free them and they will live here, I will visit them every time I want to see them”. 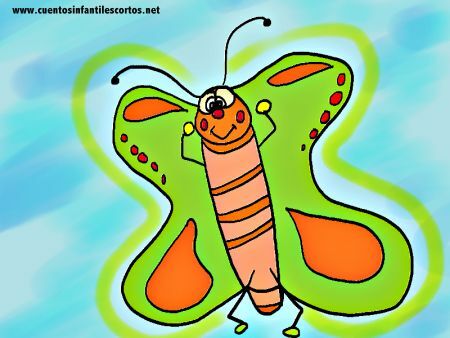 The butterfly was so happy, flied living a nice rainbow on her way, suddenly Bobby realized that it was the same butterfly he had pursued and now it was his friend. He observed the insects and realized that it was way more excited to see them in their own ambient than inside a jar. So, went back home by nightfall accompanied by a group of fireflies illuminating the way, when he arrived home, freed all the insect he had caught, he knew where to find them every time he was bored and wanted to see them again.